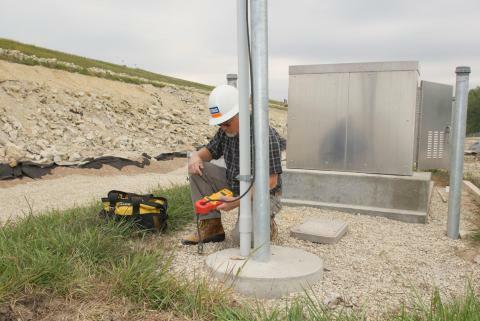 The Fall-of-Potential test method is used to measure the ability of an earth ground system or an individual electrode to dissipate energy from a site. How Does the Fall-of-Potential Test Work? First, the earth electrode of interest must be disconnected from its connection to the site. Second, the tester is connected to the earth electrode. Then, for the 3-pole Fall-of-Potential test, two earth stakes are placed in the soil in a direct line—away from the earth electrode. Normally, spacing of 20 meters (65 feet) is sufficient. For more detail on placing the stakes, see the next section. 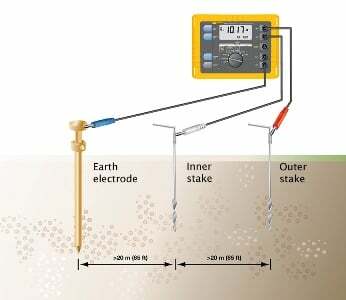 A known current is generated by the Fluke 1625 between the outer stake (auxiliary earth stake) and the earth electrode, while the drop in voltage potential is measured between the inner earth stake and the earth electrode. Using Ohm's Law (V = IR), the tester automatically calculates the resistance of the earth electrode. 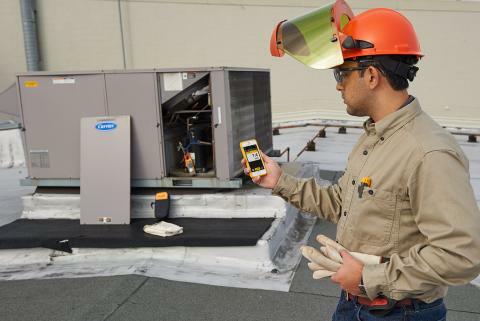 Connect the ground tester as shown in the picture. Press START and read out the RE (resistance) value. This is the actual value of the ground electrode under test. If this ground electrode is in parallel or series with other ground rods, the RE value is the total value of all resistances. How Do You Place the Stakes? To achieve the highest degree of accuracy when performing a 3–pole ground resistance test, it is essential that the probe is placed outside the sphere of influence of the ground electrode under test and the auxiliary earth. If you do not get outside the sphere of influence, the effective areas of resistance will overlap and invalidate any measurements that you are taking. The table is a guide for appropriately setting the probe (inner stake) and auxiliary ground (outer stake). To test the accuracy of the results and to ensure that the ground stakes are outside the spheres of influence, reposition the inner stake (probe) 1 meter (3 feet) in either direction and take a fresh measurement. If there is a significant change in the reading (30 %), you need to increase the distance between the ground rod under test, the inner stake (probe) and the outer stake (auxiliary ground) until the measured values remain fairly constant when repositioning the inner stake (probe).